I am super excited to announce that I've finally finished a MATH DATA TOOLKIT that I've been working on for weeks! This is going to make my life (and yours) so much easier this school year! Everything that you need for standards-based grading and helping your students to track their understanding of the common core learning standards is now at your fingertips! I CAN statements unpacked and in kid-friendly language! The best part is that you can print these out on post-it notes!!! I don't know about you, but that makes me super excited! I plan to print out all of these onto the 8 x 6 sticky notes (using the template), place in a binder and I will never again be writing out I CAN statements during the wee hours of my AM prep time!! TheY will be READY TO GO! Of course, if you don't like the idea of using post-its, these can also be printed on colored paper or cardstock. I plan to create a display for these by laminating several sheets of construction paper to use as a background, and then I can just stick (and unstick) the post-its as needed. I think I will use black, so that those neon post-its really POP! (I'll post a pic once I've got that set up in my classroom.) BTW....the extra sticky 8 x 6 post-its can be purchased at Walmart, Amazon or any office supply store! Formative assessments for each and every I CAN statement! These short, five-question assessments are designed for quick check-ins with your students. You could give them to individual students, small groups, or the whole class. Each assessment includes an open-ended journal question to help probe your students' deeper thinking on a concept, giving you a window into their understanding. Marzano-like learning scales for each CCSS strand or unit! In our district we just love Marzano (yep, we do) and are expected to have a scale for each unit of instruction. These are kid-friendly and will really help your students to know where they are in their understanding of concepts so that they can set meaningful goals. They align very nicely with the I CAN statements and the Check for Understanding assessments that are included. Student data sheets. If you use data notebooks with your students, you will find these tracking sheets very helpful. 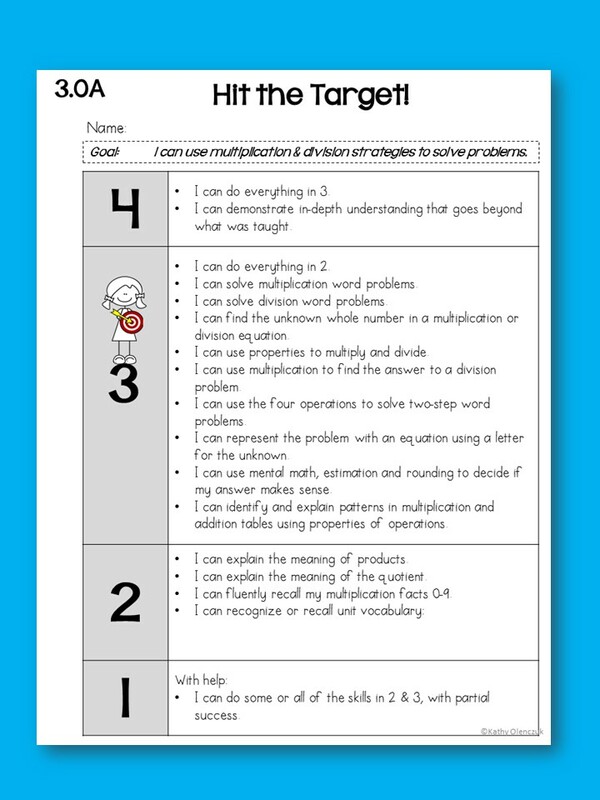 There is a student self-monitoring sheet for each strand, so that students can monitor their own progress on each I CAN statement as you go through the unit (the learning scales really help with this). 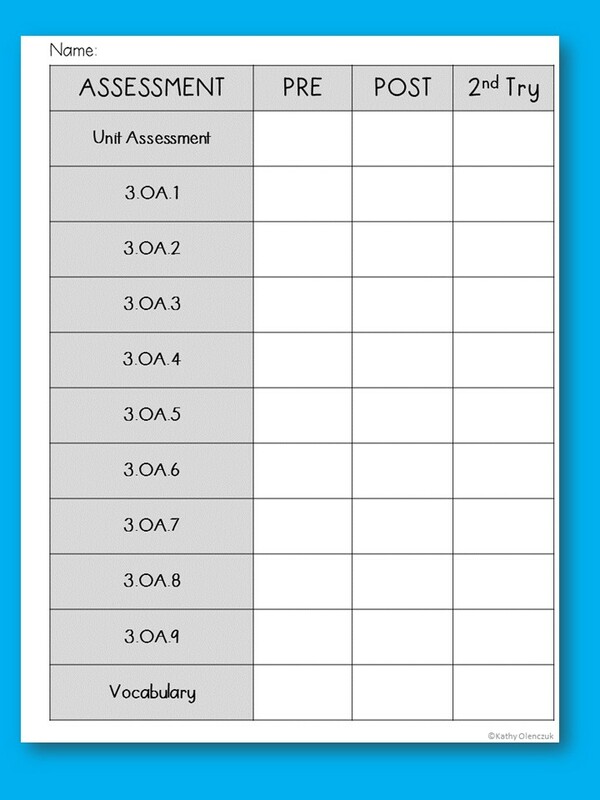 Also, there is an assessment tracking sheet for each strand so that students can record their pre and post scores. A Teacher Record Book. I have included a record book so that you can keep track of your students progress on each of the standards. The PDF is great for printing, clipping into a binder and writing student scores with your favorite color flair pen! But I have also included the Powerpoint file, which contains a table for typing the data into, if you prefer that! This product will be ON SALE....I'm talking a HUGE discount for the next 7 days! Also, just for you, because you are reading this blog post.....I am offering the I CAN statements for FREE (for a limited time). Download them RIGHT HERE! I'm sorry if this post is more like an info-merical!! I'm just so darn excited about these resources!! Thanks for stopping by today...I'd love to hear from the Peanut Gallery...so comment below! !